DURING 2014, THE ASIA PACIFIC REGION CONTINUES TO SHOW SIGNS OF OPTIMISM IN MANY MARKETS. VISITING PERTH IS ALWAYS A GOOD EXPERIENCE AND MY MOST RECENT TRIP WAS NO EXCEPTION. 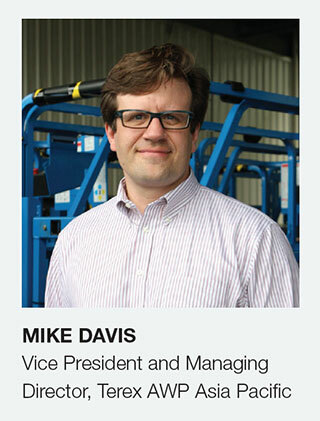 I WAS PLEASED TO PARTICIPATE IN THE HRIA EVENT AT THE NEW COATES HIRE FACILITY. TOGETHER WITH PETER STEPHENS, PAUL GREVILLE AND MICHAEL SCOTT, THE INDUSTRY GATHERING WAS AN IDEAL OPPORTUNITY TO FLY THE GENIE FLAG. About a year ago, I recall being in Perth and the mood of the market was pessimistic. This time, it was great to hear that amongst our customers, there is a genuine feeling of optimism about business in Western Australia, for 2014 and beyond. 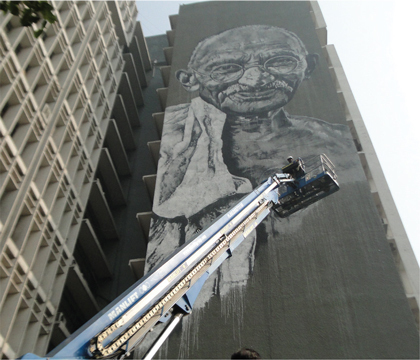 While in India recently, I was fortunate to attend a special event where a huge new mural of Ghandi was unveiled on the outside of the new Police HQ in New Delhi. The artist used a Genie® S™-125 boom lift to paint the mural. The new Genie factory in Changzhou (China) is now producing products for the SE Asia and India markets. Five dealers from the AWP region visited the plant to participate in a side by side comparison of the China built machines with our US built machines. The visit was very positive, our customers came away confident that they will be just as successful with products from our Changzhou factory as the would from any Genie factory.